Arguably the most perfectly preserved of the Cornish quoits, Chûn has a simple elegance. 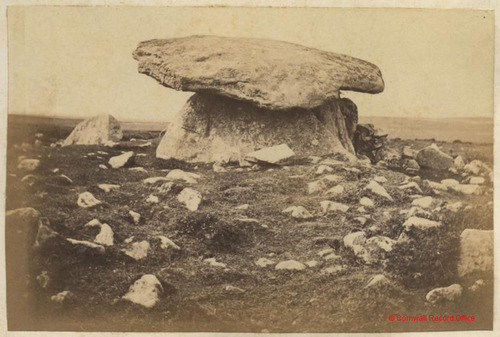 The prostrate stone at the left foreground of the photograph was noted by Charles Henderson1 as being the possible remnant of a second cist, along with a second smaller stone lying a few feet away. The orientation of this stone argues against its being part of any retaining circle, although the second stone noted by Henderson cannot be seen in either of the two photographs shown here, and could not be located when the monument was surveyed by the Ordnance Survey in 1961. Image courtesy of and © Cornwall Record Office. 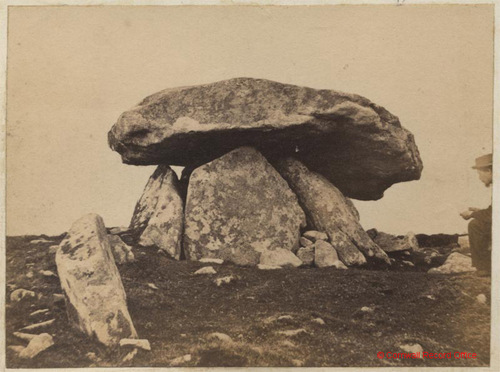 Another view of the quoit by the same photographer. William Cotton, writing in 18272, describes that the monument "stands on the S.W. side of a wild and barren hill, covered with moor stones, in the parish of Morvah, and about 500 yards from Chûn Castle, which occupies the summit of the hill. The incumbent stone is 36 feet in circumference, and measures 12 feet 5 inches, by 12 feet 4 inches, in diameter. It is 2 feet 6 inches in thickness, and very gibbous: its weight may be about 20 tons. This stone is supported on four others, forming an enclosed Kistvaen, the two side stones being 8 feet in length, and the end stones 4 feet. A low barrow, or heap of stones, surrounds this Cromlêh; and it has probably never been dug under, or disturbed from its original position." J Harris Stone commented that "there is no doubt a ring of stones formerly surrounded it, of which a few remain at its base on the north side. "3 Image courtesy of and © Cornwall Record Office. 1. Henderson, Charles Gordon. 1912-16. Parochial Antiquities: Deaneries of Penwith, Kirrier and Carnmarth, Part 1. Manuscript, Royal Institution of Cornwall. 2. Cotton, William. 1827. Illustrations of Stone Circles, Cromlehs and other remains of the aboriginal Britons in the West of Cornwall. J Moyes (2nd edition, Men-an-Tol Studio, 1998). 3. Harris Stone, J. 1912. England's Riviera: The Land's End District and its Antiquities. Kegan Paul, Trench, Trübner & Co Ltd.